Price Drop! Was: $499.95 Now: $299.97. For a limited time only, while stocks last. Lightweight and compact for easy handling and storage, our induction cooktop is a must-have modern kitchen cookware. 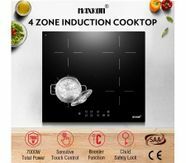 Equipped with sensitive touch controls, this portable induction cooktop with 9 power levels can allow you to set the power level of each individual zone which has the booster function too, enabling you to boost the cooktop to the max power or cool it down in seconds. For extra convenience, you can set a timer on individual zones when cooking and do other things you like. As for the safety features, this must-have kitchenware not only comes with a residual heat indicator that reminds you which zones are still too hot to touch or clean, but also has an automatic cut-off function which reduces the risk of damage to the cooktop. Better still, the child lock is ideal for any home with small children. This modern portable induction cooktop also possesses a sleek black ceramic-glass frameless design which can lend a stylish touch to any kitchen. Bring this multifunctional electric induction cookware home and upgrade your kitchen!